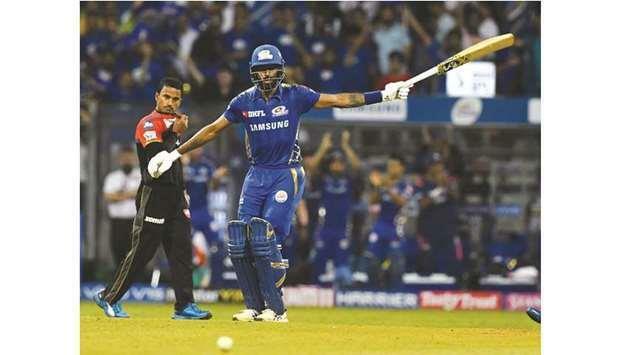 (MENAFN - Gulf Times) Hardik Pandya's (37 unbeaten off 16) quickfire cameo down the order handed Royal Challengers Bangalore their seventh defeat this season as Mumbai Indians won their Indian Premier League (IPL) tie at the Wankhede Stadium yesterday by five wickets. Chasing a competitive 172 for victory, Rohit Sharma (28 off 19) and Quinton de Kock gave a perfect start to Mumbai's innings, taking them to 52 for no loss in the initial five overs. Moeen Ali was the first to strike as his off-break delivery clattered Sharma's stumps, leaving Mumbai at 70/1 in the eighth over. Ishan Kishan and Suryakumar Yadav then forged a 33-run partnership as they repaired the major damage but Yuzvendra Chahal packed both of them back in short time to leave Mumbai reeling at 129/3 in the 16th over. It seemed Mumbai would suffer a batting collapse but it was Pandya who made sure to help his team cross the line as the all-rounder and his brother Krunal Pandya (11 off 21) took Mumbai to 148 before the latter became a victim of Mohamed Siraj. For Bangalore, Chahal and Ali picked couple of wickets each.